In the latest issue of Official PlayStation Magazine (November 2018, issue 154), Rockstar North’s Co-Studio Head Rob Nelson and Art Director Josh Bass talked about the design goals the team had when making Red Dead Redemption 2. Rob Nelson: RDR2 was a chance to completely overhaul every underlying system of the game, and our experiences creating those new-generation versions of GTA V helped us to see how we could improve, and what was possible with the new technology. Josh Bass: We wanted to move beyond the classic desert landscapes of the original game and introduce a larger cross-section of America. More advanced technology meant that it was possible to create the kind of diverse environments we were looking for, with thick mud, huge mountains, and deep, powdery snow; dark, foggy swamps, and heavily forested areas; as well as wide grassy plains. RDR2 also features the series’ first real city, the industrialising port town of St. Denis, which will feel like a stark contrast to the outposts and towns across the rest of the world. Rob Nelson: We wanted to go deeper into the world than we ever have so players truly left like this was a place to live. It’s the idea that you can go from an epic shootout on the top of a train to jumping on the back of a stagecoach and pulling cash out of the lockboxes, or looking in the cabinets of a homestead for whiskey. We’ve tried to make the game something you can get lost in at every level. 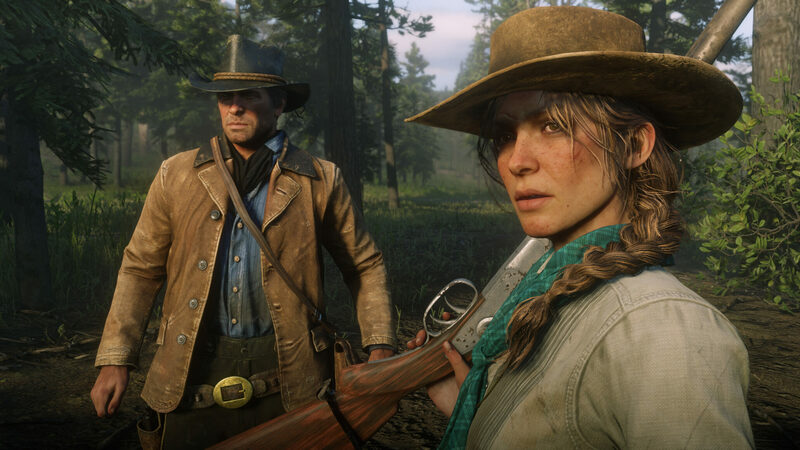 Nelson went on to say that RDR2 is both more intimate and grounded than something like Grand Theft Auto, while Bass pointed out that players will be able to make “hundreds” of decisions throughout the game that the world will react to in various ways. Rob Nelson: This game feels closer to a living place than we have ever managed to achieve before, and feels natural in keeping with the pace of America in 1899. As big as Red Dead Redemption 2 is, there’s an intimacy to this game that’s not easy to create in a world [like GTA’s] that you speed through in a car or fly over in a plane. We wanted RDR2 to feel a lot more intimate and grounded, so it made sense to push that realism as far as we could while maintaining the sense of fun. We want to create the illusion of realism without being too punitive to the player. Josh Bass: While there’s an overarching story, the game is filled with choices for Arthur to make that will allow you to decide what kind of outlaw Arthur is – whether he’s an honorable outlaw or someone less honorable is up to you. The world will respond to these choices in ways both big and small, and hopefully when players begin to share their experiences they’ll start to realise just how different they are from one another, depending on the hundreds of decisions they made across the course of the game. Red Dead Redemption 2 is out October 26th for PlayStation 4 and Xbox One. Red Dead Online, on the other hand, will be launched as a beta at some point in November. Meanwhile, we expect a lot more info (and gameplay footage) of both, so stay tuned.